Indian Handloom is an ancient and traditional art, flourishing in our country since thousands of years. 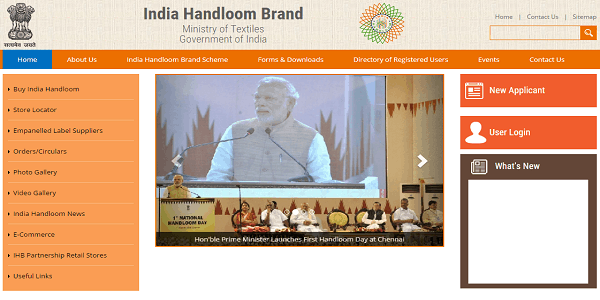 To encourage the sale of Indian handloom products, The Ministry of Textiles, Government of India has launched a dedicated website, India Handloom Brand (www.indiahandloombrand.gov.in). Thanks to the efforts of Indian Government, Indian handloom shall now have a global platform where it can be appreciated and admired by one and all. In one of the major #DigitalIndia decisions, Indian Govt. has launched official website of ‘India Handloom Brand’, wherein both consumers and producers can directly buy and sell products. As per Nitin Bawankule, Google Director for eCommerce and Online, an online market for clothes and textile will touch $35 billion by 2020. With this initiative, Government aims to promote the production of niche handloom products with high quality, contemporary as well as traditional designs, zero defect and zero effect on environment. The launch of this website is certainly a major move by Indian Government to take the legacy of Indian handloom industry to a global level. 2) STARTUP: How FreshMenu marked its presence in online food ordering marketplace?